crafting with katie: MCT 57th Edition Release Blog Hop! 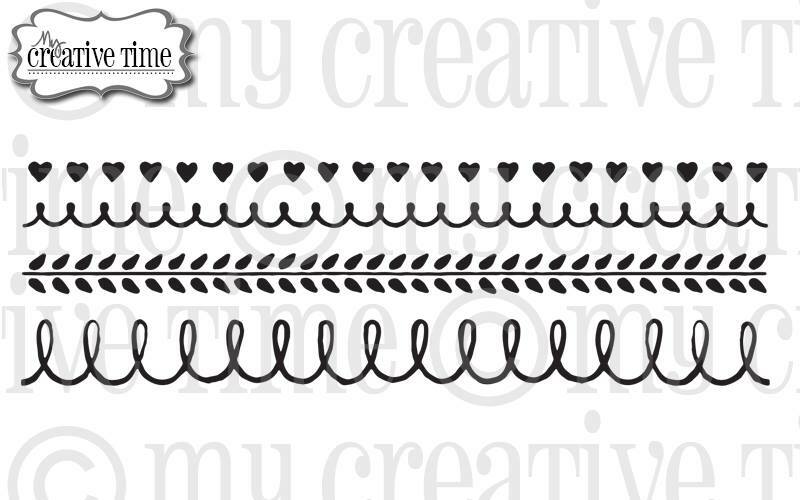 Welcome to the My Creative Time 57th Edition Release Blog Hop! You should have arrived here from the very talented Jessica. If you just happened upon here, you might want to head over to Emma's blog, to the beginning of the hop. This is a very fun release, and I hope you are as excited about it as we are! 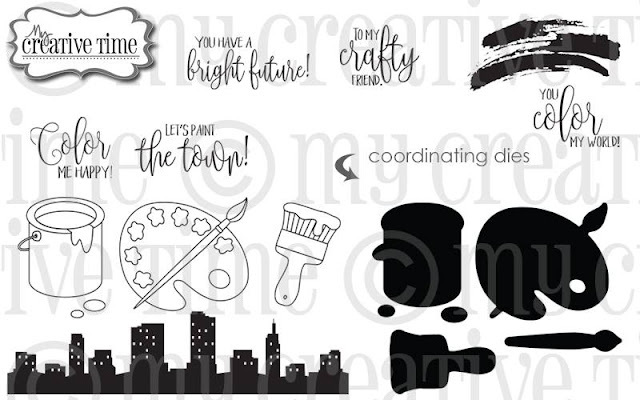 My card today showcases the new Let's Paint the Town stamp and die set and the freebie stamp set Card Borders! Both of these are such adorable sets! I thought it would be fun to take the heart border from Card Borders and create a little rainbow of hearts. I then stamped the palette and sentiment from Let's Paint the Town with Verasfine ink and heat embossed them with clear embossing powder. After coloring the palette with Zig Clean Color Real Brush Pens, I added Glossy Accents to each blob of "paint." Finally I trimmed this piece with one of the Stitched Rectangular Frame Dies and used one of the More Stitched Rectangular Frame Dies to cut the patterned paper piece. I think this will be the perfect card to send to one of my little nieces! Here's a closer look at Let's Paint the Twon. It is available now in the My Creative Time Store! Staring THIS Friday, July 15th, 2016 @ 8AM PST, our "Freebie" for this release is this adorable Card Borders stamp set. It will be given to the FIRST 100 shoppers! If you are one of the first 100 shoppers, it will be automatically added to your package at the time of packaging/shipping. Once the first 100 shoppers come through, the set will be available for purchase. So if it's for sale in the store, you are not one of the 100. No exceptions will be made. This freebie set is not a part of the "bundle" and will be sold separately! Also, DON'T FORGET our sale that is starting RIGHT NOW here! Use the code JULY2016 to receive a discount off your entire purchase! This sale applies to "IN-STOCK" items ONLY. This sale will end on Friday, July 22nd, 2016, at midnight PST. What an AWESOME card my friend!!! LOVE LOVE LOVE!!! Thank you for ALL of your fabulous sneaky peeks this entire week! OMG Miss Katie...OMG Your card is Spectacular...WOW Love your rainbow of colors...what an outstanding creative idea...WOW this will so be fab to do on a layout...thanks for you amazing idea.....Love LOVE...you so outdid yourself. YOU so ROCK!! Oh how sweet! I love the rainbow of colored hearts. Awesome job! Love that rainbow of hearts! Cute card! Very cute and colorful--I like the rainbow of hearts. cuteness, love the heart rainbow! Oh Katie, this is adorable and so cheery...love it! Your card is so beautiful! Love this release. What a sweet colorful card. I find this card to be absolutely adorable. What great new stamps and dies. Your niece will love this colorful card. Beautiful job. This is such a cool card! Love how you stamped the hearts in the colours of the rainbow! Looks fantasic! Love this stamp set. Love the rainbow of hearts with cute combo papers and LO! 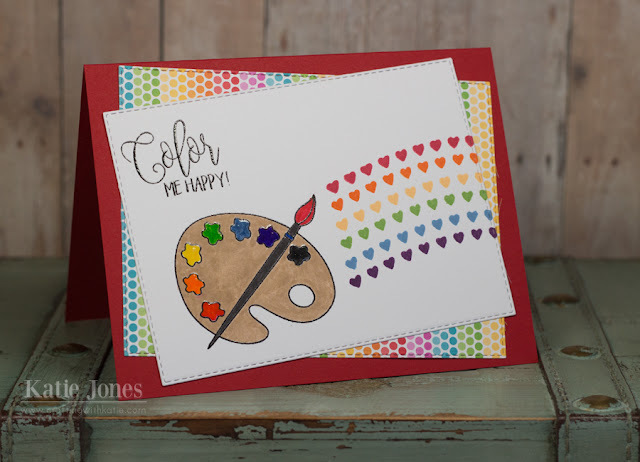 What a great idea combining embossing powder & the pallet colors and the rainbow hearts are wonderful. Thanks for the inspiration. I really LOve LOVE LOOOOVE this release. This particular set is precious and it so versatile. Thank you for sharing with us. What a great idea. Consider me 'coloured happy' in having seen your charming card! The rainbow hearts...oh my! Marvelous! A delightful finale after a week of your outstanding inspiration with this new release! Thanks for sharing your cute card. This will definitely brighten someone's day. Very nice card! Reminds me of Skittles! Yum!